Location and building damage is uncertain based on the above footage. Videos have marking AMC, which appears to be Aleppo Media Center, sponsored by Syrian Expatriates Organization, with contact address in Washington DC. 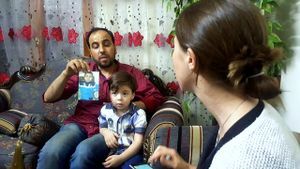 According to ABC, "Brother of Syrian Boy Who Became Face of Aleppo's Suffering Dies", Aug. 20, 2016. Ali Daqneesh, the 10-year-old brother of Omran Daqneesh, died Saturday, according to Yousef Saddiq, the director of the Aleppo Media Center. His brother, whose photo was not taken, no one mentioned him, he died and he is by God's side now. Omran was pulled out of the rubble quickly to come back to life, Ali stayed under the rubble for a while. As the volunteers scrabbled through smashed cinder blocks, the whimper they’d been hearing for hours grew louder. It was the only sign that this rubble had once been someone’s home. “Go slowly, go slowly,” shouted one as the noise turned into a sharp cry. This was always the critical moment, a time when the owner of that sound hovered between life and death and one wrong move could push them over the edge. Zakaria Zakaria in Istanbul contributed to this report. An Anglican priest has accused volunteer rescuers of keeping an injured Syrian child untreated and covered in dust and blood in a propaganda exercise against President Assad. The Rev Andrew Ashdown, whose frequent trips to Syria have led to criticism that he has been appeasing its government, said that the White Helmets, who are funded by the British government and have been nominated for the Nobel peace prize, were militants. Mr Ashdown claimed that Omran Daqneesh was left untreated while he was photographed. He showed an audience a slide of himself posing happily with ten fighters from the Hezbollah militia, which is backed by Iran, and said the Muslim paramilitaries had protected a Syrian Christian monastery. The dad of the the boy whose photo was used by the mainstream media in a propaganda war against the Syrian-Iranian-Russian alliance tells the truth about the incident. Omran’s image was widely used to illustrate the brutality of the Assad regime as it tried to crush the opposition in Aleppo, Syria’s largest city. But his family, like many others in rebel-held east Aleppo, are reported to have remained loyal to the regime throughout the siege. They refused all media interviews and reportedly went into regime-held west Aleppo when they had a chance. And, of course, its possible they had to play along with the opposition's propaganda at the time for their own safety, to avoid further loss of children. Their choice in direction of flight suggest the later story is probably more credible and less coerced than the first one. But that's a circumstantial argument and not proof. Omran’s father, Mohammad Kheir Daqneesh, had six children, including Omran and the late Mohammad Ali. On the evening of Aug. 17, 2016, an event that has yet to be adequately explained occurred in the Qaterji District of the Syrian city of Aleppo. 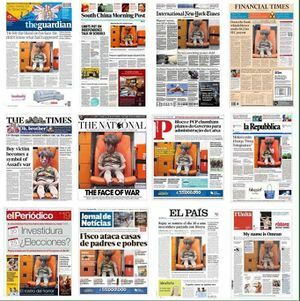 Four-year-old Omran Daqneesh, as well as his siblings and parents, were injured in media alleged was an attack by the Russians – or the Syrian military, depending on what source one chose to believe. People in Aleppo suggested it could have been a strike by the US-led coalition. The reality is not yet known. ...Mr. Daqneesh denied any knowledge of a Russian or Syrian airstrike, saying that he had not heard any airplanes at the time. “I was with my family in al-Qaterji neighborhood when our house damaged due to an explosion whose source we didn’t know, and although I was wounded I carried my child Omran who was unharmed and rushed out for fear of a new explosion, the father said. He went on that a number of terrorists came and snatched Omran from his hands and put him inside an ambulance and took photos which they published later in a way that suits their propaganda and lies, confirming again that Omran has not injured and all the photos of him were staged by the terrorists. “The terrorists asked me to accompany them outside the city to record false statements about what happened to my son in exchange for large sums of money, but I refused and stayed in Aleppo and didn’t submit to their demands despite the massive pressure and threats they used against me,” he confirmed. 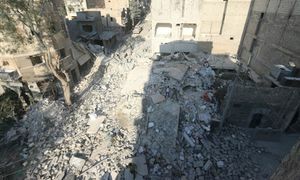 The Russian Defense Ministry said in a statement it never targets populated areas and that rebels themselves hit urban areas in order to derail humanitarian efforts there. The ministry also said the footage of the boy’s rescue showed windows in the house next door intact, indicating that the boy’s house was not targeted by an airstrike but was hit with a mine that rebels use. better translation of the ending given by TASS: "(mortar) shell or a gas cylinder widely used by terrorists there". Syria's Civil War: Yet another 'iconic image'? by Hamid Dabashi, Hagop Kevorkian Professor of Iranian Studies and Comparative Literature at Columbia University, USA, Aljazeera, 18 Aug 2016. This is not an icon. This is Omran Daqneesh. He is a Syrian boy. He is alive. (...) That gaze is the look of our damned eternity on this Earth. The United Nations Security Council discussed the humanitarian situation in Syria on Monday, 22 Aug., 2016. The delegations of the United States, Britain and Ukraine blamed Russia for civilian deaths in Syria. Al-Jaafari: Syrian, Russian air force didn’t target al-Qaterji neighborhood in Aleppo, SANA, 22 Aug. 2016. New York, SANA-Syria’s permanent envoy to the UN Bashar al-Jaafari said on Monday that the Syrian, Russian air force didn’t target al-Qaterji neighborhood in Aleppo and “you have to search about the real criminal.” Al-Jaafari said at a UN Security council session that the first and last responsible for the civilians’’ suffering in Syria are the governments that falsely claimed they are friends of the Syrians. Churkin urges US-led coalition to analyze its actions in Syria, TASS, 22 Aug. 2016. Far too many of the photographs taken after airstrikes in hospitals and amid collapsed buildings are gruesome. The Omran picture delivers a shock to the conscience but also strikes a balance between delivering a sharp message and being too difficult to view. It is compelling but not grisly; it can enter an Instagram feed or a Facebook wall, arouse sympathy, be shared and allow the viewer to move on without seeing the absolute worst of what war has to offer. This page was last edited on 14 June 2018, at 05:43.